Toasty wooden cottages glow orange inside with lamps and firelight, stood close to the banks of a twinkling lake. Behind, snowy trails slip between the pines and whiteness spreads for miles. This is Jeris, our fun-packed family destination in a beautiful location by the forest and water! Our holidays here include a wintry adventure featuring the very best Nordic activities and an excellent Christmas getaway with special festive things to do – chief among which is an audience with the one and only Santa Claus! The Jeris resort sits beside the magical Lake Jerisjärvi, which becomes an icy mirror during the colder months. Finland’s third largest national park extends eastwards: Pallas-Yllästunturi, a land of white hills and calm forests. It’s like a trip straight into Narnia – without the evil White Witch, of course! The main hotel is wonderfully cosy and has its own lakeside spa complete with smoke rooms and hot pools. 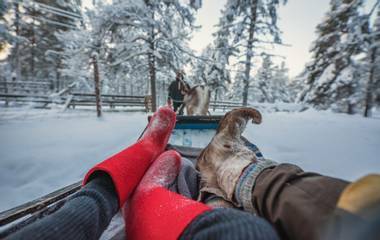 Travel with us here and you’ll also be very well fed: the hotel restaurant provides tasty Lapland specialities and also boasts a bar with a great big roaring fireplace. Spend exciting times in the outdoors and return to the comfort of your snug accommodation. Jeris is warmth in the frosty wilderness! Our standard winter trip to Jeris is anything but ordinary. You’ll soon find yourselves snowmobiling through incredible scenic spaces, stopping for a picnic lunch made on the spot over a campfire. Harnessing husky dogs to a sled, you’ll be whisked away on a safari covering over 15 kilometres – keep an eye out for camouflaged wildlife! The dogsledding ride is definitely our most popular activity, with rave reviews from previous holidaymakers. The whole family can pick up the art of ice-fishing like the locals, with a knowledgeable guide there to hand down essential techniques which have crossed generation after generation in this land. You can tackle terrific slopes with a spot of Nordic skiing – the courses are brilliant for getting the adrenaline going. 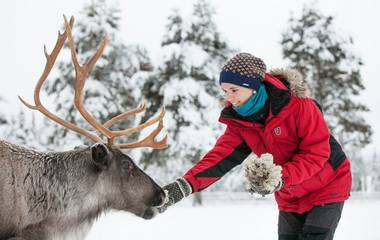 Area-specific treats include heading to the nearby Torassieppi Reindeer Farm, where children and adults will enjoy seeing how these lovely creatures have been herded for well over 150 years; another is the spectacular Torassieppi Winter Village, built entirely of ice and snow! You’ll also have a chance to look for the Northern Lights, as Jeris is in the Aurora Zone. Our Christmas holiday features many of these activities with the addition of seasonal craft-making, treasure hunts and a wishing-tree search, a scrumptious Christmas Eve buffet, and an audience with the jolly man in red! The setting of Jeris looks like a painting come to life, or a description in a book brought to reality. You might blink several times when you get there out of disbelief at the amazing reality of it all! It really is a marvellous activity destination – get ready to lose yourselves completely while heading around on a snowmobile or cross-country skiing. 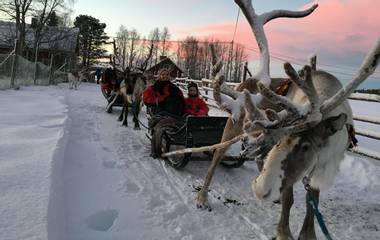 You’ll greatly appreciate the immense tradition that stands behind the Torassieppi Reindeer Farm. The relationship between the owning family and their animals is simply extraordinary and heart-warming to watch. On the other hand, the Winter Village will bowl you over with awe: if you thought places like this only existed in films, think again! 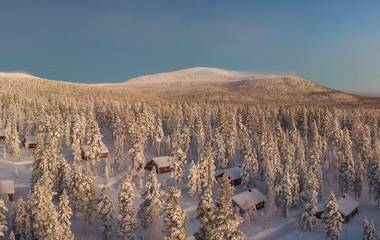 There’s no better place to spend Christmas than the home of Christmas itself, and our Jeris holiday gives you a true Lapland experience. Santa Claus is as delightful as anyone would imagine, taking time to listen to each child and hear their holiday wishes. The holiday is bursting with a festive feel, and everyone will thoroughly enjoy being a part of it – book as soon as possible, as it fills up fast!